Flowers and Butterflies help to create a festive spring wreath from this free crochet pattern from Lily Sugar n' Cream. Decorate for Easter or display it all season long to welcome guests. 1 ball of Ombre makes 9 Butterflies. 1 ball of Solid makes 18 Bells. 1 ball of Solid makes 7 Daffodils. 1 ball of Solid makes 35 Leaves. Size 4 mm (U.S. G or 6) crochet hook or size needed to obtain gauge. 5 brown chenille stems, 22 pompoms 1/4" [5 mm] wide and thread-coated wire for Butterflies. Glue gun and glue sticks. Willow wreath 14"[35.5 cm] in diameter. Dried flowers for decoration if desired. 16 sc and 16 rows = 4" [10 cm]. 1st rnd: (RS). 6 sc in 2nd ch from hook. Join with sl st in first sc. 3rd rnd: Ch 1. 1 sc in each of first 2 sc. 2 sc in next sc. 1 sc in each of next 2 sc. 2 sc in next sc. Join with sl st in first sc. 8 sc. 4th rnd: Ch 1. 1 sc in same st as last ss. (2 sc in next sc. 1 sc in next sc) 3 times. 2 sc in next sc. Join with ss in first sc. 12 sc. 5th and 6th rnds: Ch 1. 1 sc in same st as last ss. 1 sc in each sc around. Join with sl st in first sc. 7th rnd: Ch 1. Miss first and 2nd sc. (5 dc in next sc. Miss next sc. Sl st in next sc. Miss next sc) 3 times. Join with ss in first ch 1. Fasten off. 1st rnd: 6 sc in 2nd ch from hook. Join with sl st in first sc. Ch 10. Fasten off. Join Pistil to Bell. Glue Bells in cluster as shown in picture. Ch 6. Join in round with ss in first ch. 1st rnd: Ch 1. [(1 sc. Ch 6. 1 sc) all in ring] twice. [(1 sc. Ch 4. 1 sc) all in ring] twice. Join with sl st in first sc. 2nd row: Sl st in next ch 6 sp. (Ch 3. 4 dc. 1 tr. Ch 3. Sl st in first ch – Picot made. 1 tr. 5 dc) all in next ch 6 sp. Sl st in each of next 2 sc. Rep from once more. (9 dc in next ch 4 sp. Sl st in each of next 2 sc) twice. Fasten off. Glue foundation ring closed vertically. Glue opening of each wing closed vertically. Cut desired length of chenille stems for Body as illustrated. Make antennas with wire as illustrated. Glue pompoms to top of antennas. 1st rnd: (RS). 6 sc in 2nd ch from hook. Join with sl st in back loop of first sc. First Petal: 1st row: Ch 1. 2 sc in back loop of same sc as last sl st. Ch 1. Turn. 2nd row: 2 sc in each sc. 4 sc. Ch 1. Turn. 3 loops on hook - Sc2tog made) twice. Ch 3. Turn. 7th row: Miss first sc. Sl st in next sc. Sl st in side of each of next 5 rows of petal. Sl st in last sc worked on 1st row and in back loop of next sc. Do not turn. Ch 1. 2 sc in back loop of same sc as last sl st. Ch 1. Turn. 2nd to 7th rows: Work as given for 2nd to 7th rows of First Petal. At end of Sixth Petal, fasten off. Trumpet: Join F with sl st to any front loop of 1st rnd. 1st rnd: Ch 1. 2 sc in same sp as last sl st. 2 sc in front loop of next sc. Rep from around. Join with sl st in first sc. 2nd rnd: Ch 1. 1 sc in same st as last sl st. Ch 1. 1 sc in next sc. Rep from around. Join with sl st in first sc. Fasten off. 1st rnd: (RS). 1 sc in 2nd ch from hook. 1 sc in next ch. 1 hdc in next ch. 1 dc in each of next 4 ch. 1 hdc in next ch. 1 sc in each of next 2 ch. 3 sc in last ch. 1 sc in each of next 2 ch. 1 hdc in next ch. 1 dc in each of next 4 ch. 1 hdc in next ch. 1 sc in next ch. 2 sc in next ch. Join with sl st to first sc. Fasten off. Using photo as a guide, assemble all pieces on Wreath and glue in position. If desired, break small lengths of dried flowers and attach to Wreath randomly as shown in picture. This is really cute. I think it would be a great way to use up leftover yarn too. I really like the bell shaped blossoms. It would be a very easy project to carry along to work on in the car or anywhere. Make up a series of the blossoms or butterflies while watching television or listening music. It would make a sweet gift for someone's birthday, Mother's Day or Easter. I had fun making it. It would of been heplful if there were close-up photos of the individual elements. What a welcome addition to grace your front door to welcome your guest into your home. 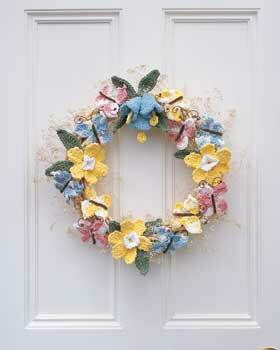 This wreath is bright and cheery, it would put a smile on anyones face as they walk up to your door. You can put this together using your favorite flowers and then adding your favorite color bow and it is ready to hang on your front door. Something is missing. In the directions for the butterfly, on page 3, is says "Rep from once more". Question is, rep from WHERE one more. Please help...am I missing something!